Before creating task lists or an individual task, it's recommended that users add/update the task types to better categorize the to-do items across the organization. Task types are the various specific tasks that an organization may require. For example, flight follow, call, submit paperwork, check weather, etc. When you create a task, the user is required to select the task type within the task. Enter the name of the Task Type and click "Create"
A variety of task lists can be created within the application. 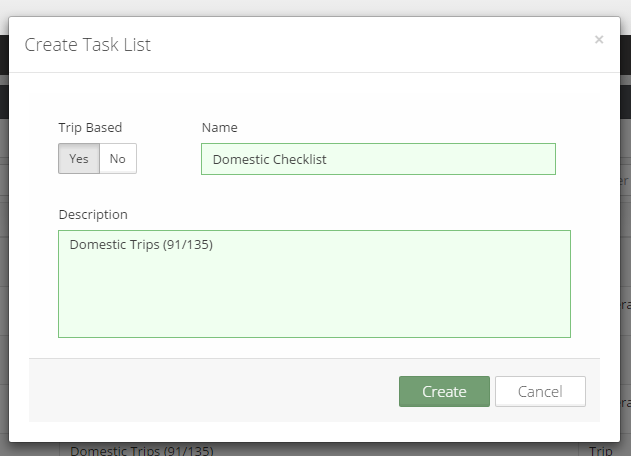 Task lists can be general or trip-specific. 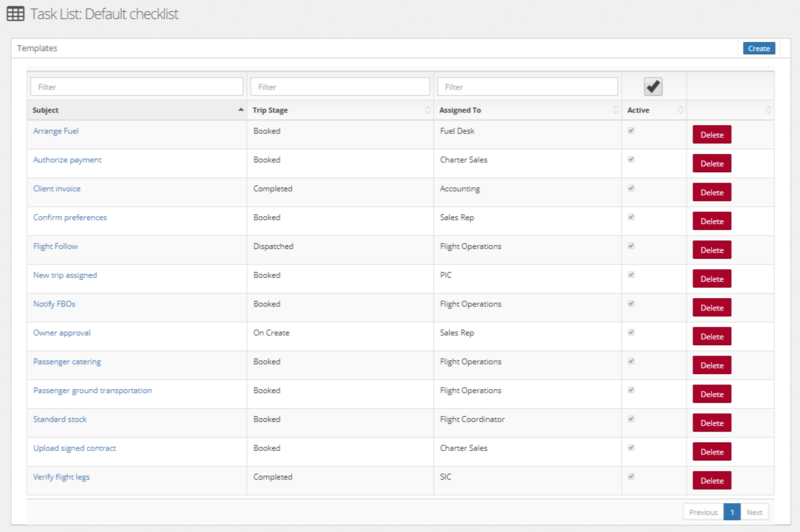 General task lists can be manually applied to any record in the system and are a great way to standardize internal processes such as new aircraft or personnel setup/on-boarding. On the other hand, trip specific tasks can be initiated automatically on creation of the trip or at any stage through the process. In addition, conditions can be set for any trip task item so it only creates when a specific situation occurs. The conditions that can be set are aircraft/aircraft type, airport/country and accounts/account type/contacts. In this example we are creating a trip based task template. 6. To add a task to the list, click "create"
7. Enter the applicable information and click "save"
There are various fields within a task item, so the user is able to define conditions and get very specific on each task item. Here is an explanation of all fields within a task item. Assigned To - In a trip task list select personnel who contains a position (PIC, SIC, Flight Coordinator) on the specific trip or a group (i.e. Flight Coordinators, Sales, etc). In a general task list, the user is able to select a personnel or group. The tasks will show in the Dashboard under My Tasks and My Group Tasks. 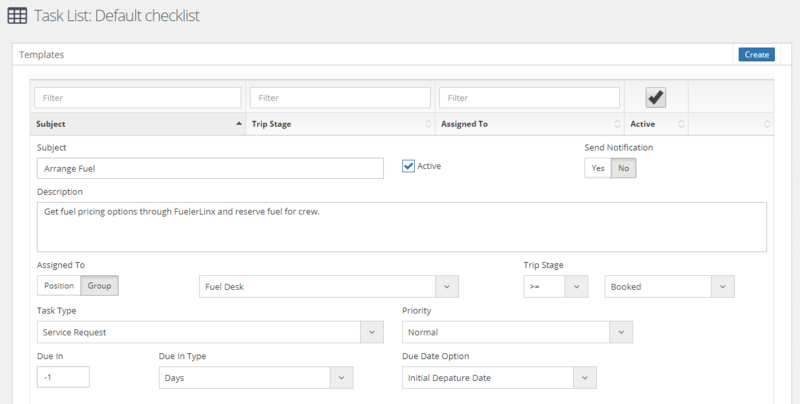 Trip Stage - This field is only applicable to a trip task list. Selecting equals means this task item is initiated on the selected stage (create, booked, dispatched, completed, etc). If greater than and equal to is selected on a task that contains conditions such as airport, country, aircraft, etc. and a change occurs to the conditions later than the initiated stage, then the task becomes present again. Due In - Enter the value based on minutes or days the item is due. If the task needs to be due before the "due date option," enter a negative "due in" quantity. For example, Due 1 day before initial departure date. Enter -1 into the "due in" field. Other conditions (Trip Type, Aircraft/Aircraft Type, Airport/Country, Accounts/Account Type/Contacts) - When conditions are included the task is only automatically included in the trip if those conditions are associated to the trip. Only one condition can be selected per group. For example, if Account Type is selected, Accounts and Contacts selection will no longer be an option. If Airport is selected, country will no longer be available. 8. Continue creating task items to build the task list (see below). 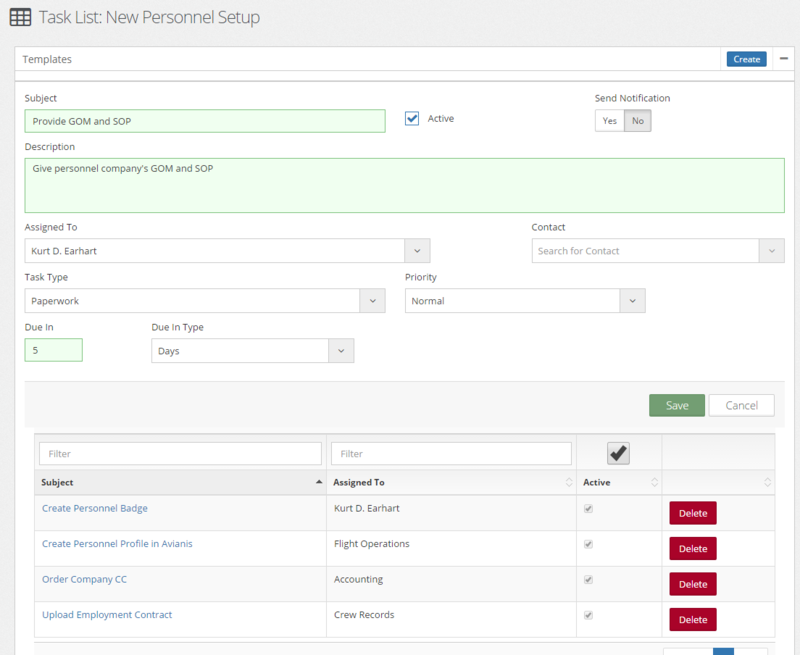 Here is an example of a general task list called New Personnel Setup. The items in the list below are each of the tasks that make up this task list. Helpful Hint: When entering the "Due In" value, if the task needs to be completed "before" enter a minus before the value. 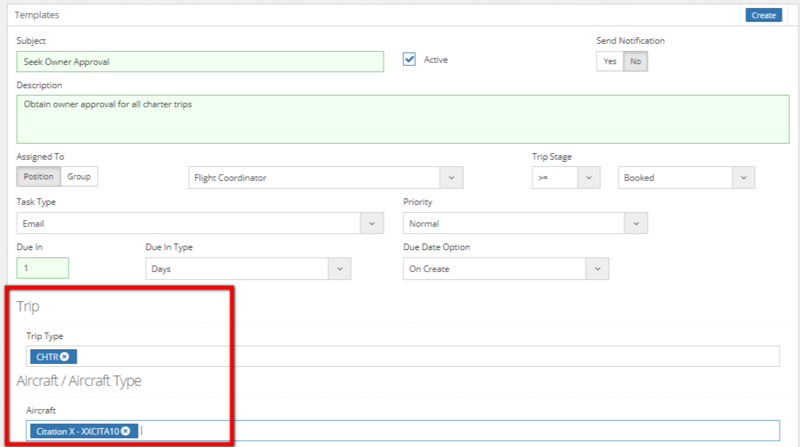 For example, if due 2 days before Initial Departure Date, enter -2 in the "Due In" field. Then the due date will calculate accordingly. This task will trigger when the trip stage is greater than or equal to booked, the trip type is set to CHTR and trip is on aircraft XXCITA10.